Billie Sol Estes may be ACU’s most notorious non-alumnus. The Clyde native with a penchant for amassing wealth, rubbing shoulders with prominent politicians and stepping into scandal never actually attended Abilene Christian. (His mother once said he “just wanted to make money” instead.) But the rest of his family – including his older brother and his five children – attended ACU with his financial support. And his daughter served as editor of the Optimist while earning a degree in communication. Estes, at one time considered the richest member of the Churches of Christ in Texas and a selfless benefactor of charitable causes, built up a fortune in Pecos by selling irrigation equipment to local farmers. During that time, he also took advantage of government cotton quotas, federal fertilizer subsidies and a tightening relationship with then-Sen. Lyndon Baines Johnson, to further expand his riches. He bought up cotton allotments from neighboring farmers, falsely claimed to grow and store the crops and used non-existent cotton and fertilizer as collateral for bank loans. In April 1962, Estes and several business associates were indicted by a federal grand jury on 57 counts of fraud. Estes was accused and eventually convicted of swindling investors, banks and the federal government of at least $24 million. Department of Agriculture staffers suspected of helping Estes lost their jobs, and Vice President Johnson quit answering questions about him from reporters. Indeed, Estes’s business shenanigans were national news, feed by suspicion of Johnson and his Texas Democratic machine. 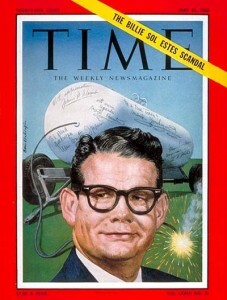 In fact, the cotton and fertilizer Ponzi scheme and its political implications landed Estes on the cover of Time Magazine the year he was first tried and convicted. 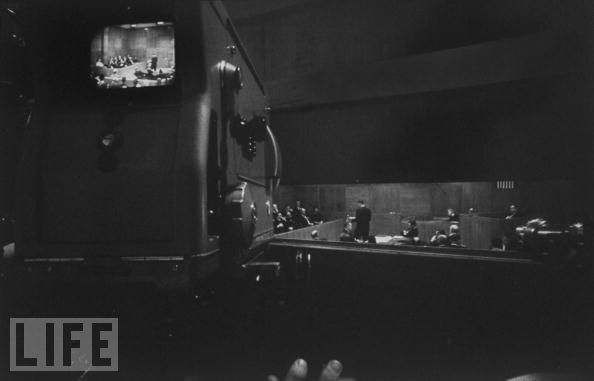 His first conviction was overturned by the U.S. Supreme Court when it ruled the camera’s used to televise the trial in Tyler were inherently prejudicial. He was later tried in El Paso without television cameras and was convicted again. When he finally emerged from prison in the mid-1980s, Estes began dishing dirt on his political cronies – most significantly the former president. Most significantly, Estes claimed inside knowledge that LBJ, aware that the Estes agriculture scandal might hurt his chances to stay on the presidential ticket in 1964, orchestrated the assassination of President John F. Kennedy. Though Estes’s claims made it into several books, including one he penned in 2003, Estes never provided evidence to federal authorities.